Before starting to write about customer experience trends for 2018, I wanted to get a lay of the land. I love when I hear more executives say customer experience is crucial to their company’s business strategy. In 2015, Accenture reported that 41% of respondents it interviewed said that customer experience was critically important to its business strategies. In 2017, it reported that number jumped to 90%. Companies understand that customer experience is becoming the key brand differentiator. They understand customer experience drives reduced operating costs and increased revenues. Yet, many are still dragging their feet in implementing customer experience initiatives. I get it. We live in an instant gratification society. Brands want guarantees that the money they put in yields significant outcomes. Yet, customer experience doesn’t work that way. It’s hard work. It’s not one-and-done. You’re continuously making improvements to drive performance. Brands are reluctant to invest in something that won’t generate immediate results. They believe those investments don’t produce enough of a result to maximize profitability. This might be part of the reason why, according to the 2017 Salesforce State of Marketing report, that while 67% of marketing leaders say creating a customer journey across all touchpoints and channels is critical to their success, only 23% are extremely satisfied with their ability to leverage customer data to do so. Then, there’s the whole subject of digital transformation. Last year, Forrester found that 74% of respondents believe digital is reinventing the experience they deliver to their customers. It also found that there is a growing gap between brands’ ambitions and their capabilities. In 2015, 78% of organizations, when asked, said they believed that processes and technology were in place to execute on its digital strategy. In 2016, that number dropped to 66%. Worse, it seems that executives are complacent about it. The 24% who said they don’t meet customer expectations, they believe their customer experience is good enough. It’s dangerous to be complacent when customer expectations are changing on a dime. This much is clear – customer experience efforts are still falling short of expectations. While 52% of respondents in Forrester’s study believe they are ahead of their competitors, only 7% are exceeding customer expectations. IBM’s Institute for Business Value, in its recent research, may know why this is. Until brands get on the same page as their customers, they’ll continue to design customer experience initiatives that miss the mark. Forrester, in its latest report, Predictions 2018 a year of reckoning, says customer experience has hit a wall. According to Forrester’s 2017 CX Index, customer experience quality plateaued or declined. While companies had some early wins, most initiatives haven’t forced meaningful operational change. 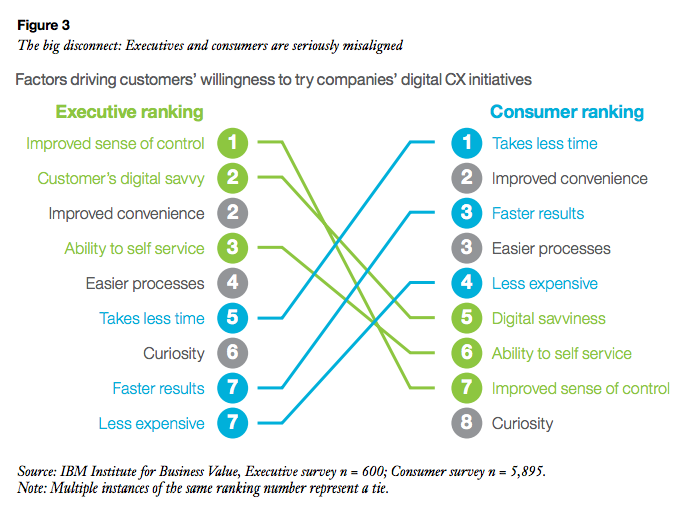 Customers’ expectations will outpace companies’ ability to deliver experiences to keep up. Customer Experience leaders will adapt. Laggards, of which there are many, will continue to ignore the signs and procrastinate. As a result, these companies could be at significant risk and perish. There is a growing division between what the customer expects and what an organization can deliver. Customer behaviors are changing at lightning speed. And the combination of the two is resulting in churn. If brands don’t have digital transformation initiatives in place, they lose market share. So, at present, customer experience transformation is struggling to deliver on its promise. So, while customer experience may have slowed down, it can gain ground in 2018. The following top 5 customer experience trends for 2018 can help brands get back on track. It is the rubber-meets-the-road time for omnichannel. No longer is omnichannel a nice-to-have. It is the rule. Of course, the key for omnichannel is digital. Yet, according to Forrester, 60% of executives believe they are behind in their digital transformation. Companies that are slow to digitize their customer experience initiatives are leaving money on the table. According to the National Center for the Mid-Market (NCMM), only 38% of middle market companies claim to be highly effective at customer experience digitization and only 12% have a truly omnichannel digital customer experience across all platforms. NCMM says the slow integration is a problem. CMO Council notes that 55% of companies have no cross-channel strategy in place. They cite lack of resources and investment as their top barrier to omnichannel marketing. That isn’t aligning well with customer expectations. 75% of consumers expect a consistent experience wherever they engage be it web, social media web or in person. 87% of customers think brands should put more effort into providing a seamless experience. And, Accenture notes in recent surveys that 65% of respondents are frustrated in inconsistent experiences when they are using multiple channels. Providing a true omnichannel experience seems like a no-brainer when you look at the economics. Omnichannel shoppers have a 30% higher lifetime value than those who shop using only one channel. Companies with extremely strong omnichannel customer engagement see a 9.5% year-over-year increase in annual revenue, compared to 3.4% for weak omnichannel companies. Strong omnichannel companies see a 7.5% year-over-year decrease in cost per contact, compared to a 0.2% year-over-year decrease for weak companies. Brands must continue to improve the omnichannel experience by looking out for new capabilities and technologies that they can leverage. Social Customer Service is a must. If Social Customer Service wasn’t a must before, it is now. Gartner believes that by 2020, 90% of customer service will occur through social media. A recent study that Five9 conducted with the International Customer Management Institute (ICMI) revealed that while more than 68% of businesses recognize social media as a necessary service channel, 60% of companies are not formally supporting social customer care. And, in a recent study that Sprout Social conducted, as much as 80% of social customer inquiries have remained unanswered. The economics make social customer service another no-brainer. According to Conversocial, 88% of consumers are less likely to buy from companies who leave complaints unattended. And, Gartner found that failure to respond via social channels can lead to a 15% increase in churn rate for existing customers. Yet, Bain notes that when companies engage and respond to customers over social, those customers spend 20-40% more with them. And, according to Aberdeen, companies that have a well-crafted social customer service approach experience 92% customer retention. Social Customer Service is cost-effective, too. In Conversocial’s State of Social Customer Service Report, it stated that according to Gartner, it costs less than $1 per interaction on social, compared to $6 per phone call and $2.50-5 per email. Social Customer Service will help brands shape conversations by engaging customers before and after the sale, which will drive customer value. Artificial Intelligence (AI) must be re-evaluated. Forrester predicts that in 2018, 75% of AI projects will underwhelm because they fail to model operational considerations, causing business leaders to reset the scope of AI investments — and place their firms on a path to realizing the expected benefits. While AI, machine learning, and chatbots can help brands enhance customer experience, their effectiveness is losing ground. This is because brands don’t have a sound strategy in place where they can leverage these technologies effectively. But, companies that have given thought to an AI strategy and how it contributes to business outcomes, succeed. As Linda Yeardley, Digital Transformation Director at eGain Communications, notes, “AI is being more widely adopted and is delivering quantifiable business benefit where it is being used to meet an unambiguous business challenge for which there is a well-defined and well-structured set of data from which to generate the ‘intelligence’”. Companies get into trouble when they use AI for more than for what it was intended. As Yeardley cautions, “There’s a danger of putting the cart before the horse if we talk about implementing AI into CX strategies. Rather, the CX strategy should determine the desired business outcome; if the best solution for achieving that outcome is driven by AI then it will be the logical tool to choose. Trying to push AI as a solution looking for a problem will only lead to expensive projects that fail to deliver expected benefit, which has fuelled the disappointment of previous AI hype-cycles”. In a recent study, Salesforce found that more than 70% of consumers expect companies to understand their needs and expectations. The study also cited that more than 50% of consumers expect that by 2020 companies will anticipate their needs and make relevant suggestions before they make contact. I discussed proactive customer service in my 2017 trends post. Proactive customer service is here and will continue to be enhanced. NICE InContact reported a few years ago that 87% of respondents want companies to be proactive in their customer service initiatives. And, because of the push for proactive, more companies embrace emerging technologies like predictive modeling, Internet of Things (IoT) and AI. This is where having a strong voice of the customer program to understand emotions and behaviors help companies become better at anticipating needs and expectations. Self-service continues to be popular. This doesn’t just apply to customer service, but to all manner of interactions customers have with brands. Brands win when they deliver relevant, effortless and convenient experiences. And, when customers perceive value, they reward the brand. Continued focus on personalization with drive revenue and loyalty. Customer Experience and Customer Success converge. We expect to see Customer Experience and Customer Success converge in 2018. We’ll see customer success start embedding more emotion analytics and metrics into its framework. This will have two results. First, it will enrich the customer feedback it receives. Second, it will help customer success understand how underlying emotions drive customer outcomes so as to generate deeper customer outcomes. Also, customer experience will focus more on the specifics of onboarding (to combat churn), retention, and expansion in the customer journey. This will help align customer metrics with business outcomes in order to drive deeper customer outcomes. We’ll also see convergence at the customer journey level. Customer journey mapping will expand in 2018. More companies will invest in customer journey mapping. More teams will use customer journey mapping. And, customer journey maps will go into more depth. We’ll see customer success journey maps look more like end-to-end customer journey maps. This convergence will help bust silos. This unified, customer-centric approach will enable more collaboration among teams. And, as a result, it will drive even more growth. We’re starting to see customer success software migrate to a more customer-centric approach. Customer expectations will continue to evolve. Leaders that adapt quickly to this truth will succeed. Those who don’t won’t. The opportunity for brands is that customers will migrate to those brands that deliver those experiences they want. These customer experience trends for 2018 can help. 2018 will be the year of speed. The quicker and more aggressively a brand can align itself to what the customer wants, the more it will drive growth and market share.